The classic romance of 24 red roses can say so many things, from "I love you!" to "I'm sorry." Stunning in its simplicity, this elegant arrangement of deep red roses, rich green salal and delicate pitta negra makes quite an impression. 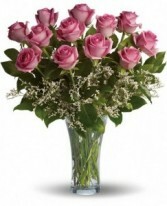 It's the perfect choice when you want to send flowers to your girlfriend's office! 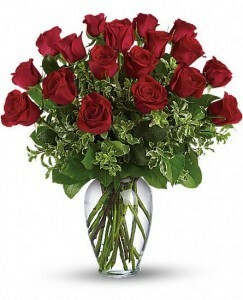 Two Dozen Red Roses Are Arranged With Salal And Pitta Negra In A Spring Garden Vase, Approximately W X H, This Item Is Handarranged And Delivered By A Royal Bloom Florist, All Prices In Us Dollars. 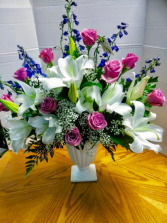 One Dozen Pink Roses Are Gathered With White Limonium And Rich Green Salal In A Classic Trumpet Vase Shell Use Again And Again, Approximately W X H.